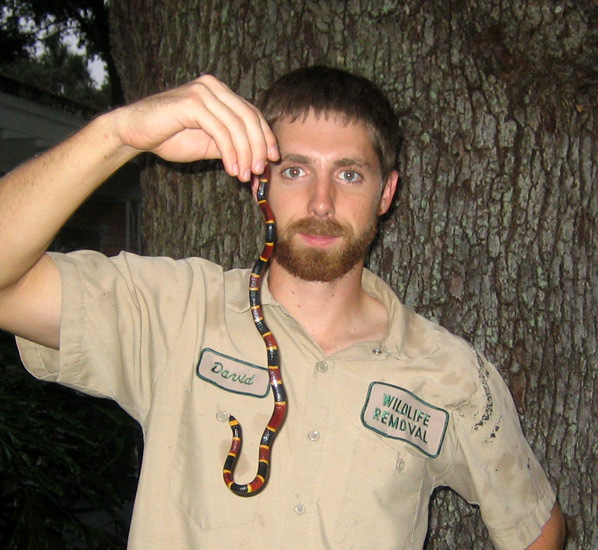 Here we have an Eastern Coral Snake, captured 10.22.2005 in an Orlando FL garage. This is an average sized specimen, at about 24". This is one of Central Florida's four venomous species of snake, but unlike the pit vipers (rattlesnakes, cottonmouth) the Coral Snake is a member of the family Elapidae, which includes the Cobras, Mambas, & Sea Snakes. It possesses an extremely potent neurotoxic venom which typically causes paralysis of breathing, and can be fatal to people. However, it is small and timid, so bites are rare. You may have heard the old rhyme to help differentiate the lethal Coral Snake from lookalike copycats like the Scarlet King Snake. The rhyme goes, "Red touch yellow, kills a fellow. Red touch black, friend of Jack". As you can see, red is touching yellow. Luckily, neither fellow (me nor the snake) was killed. Some people also look at the nose: the Coral Snake has a black nose, whereas the copycats don't. This is a very nice photo of the Coral Snake's head. I was rather pleased to finally capture the elusive Eastern Coral Snake. Like most venomous species, it is rare here in Orlando. It also tends to spend time under heavy debris, so it is rarely seen. Information about coral snake - The coral snake is a brightly colored serpent with yellow, red, and black banding. It is one of the most deadly snakes in North America, but sightings are infrequent and attacks rare. Unlike the other venomous serpents in this region, the coral snake does not have collapsible fangs, nor are the teeth attached to venom sacks. 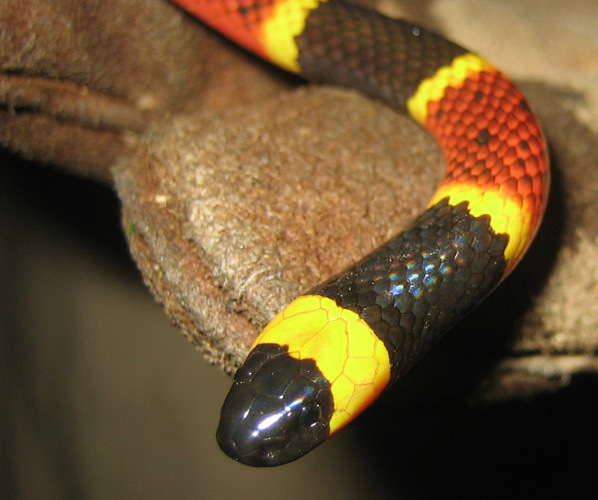 The coral snake instead has permanently erect teeth, and the venom sacks are located in the space adjacent. When the reptile bites, venom seeps in through the wound. The longer the snake holds on, the more venom that enters the victim�s body. 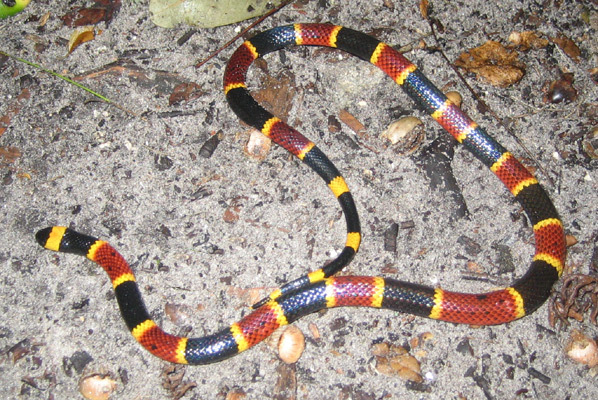 A good way to identify the coral snake is with the rhyme: Red on black, safe for jack. Red on yellow, kill a fellow. This song will only keep you safe in North America. Coral snakes exist in many other regions of the world; they are all venomous, but they do not all have the same coloration. 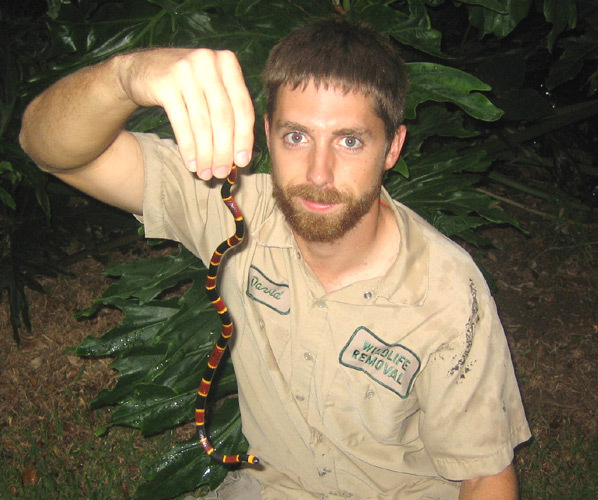 Read more about coral snake look alikes here. This species of snake breaks almost every snake hunter�s rules about identifying a venomous serpent. The coral snake has a rounded head instead of a triangular one; it has rounded pupils and not slits; it does not have any heat-sensing pits. All other vipers in North America have these traits. How does the coral snakes venom affect the body - The coral snake is the deadliest out of all the North American venomous snakes. There are hundreds of species of coral snakes around the world, and all are deadly carriers of neurotoxic venom. When you look at the coral snake, the first thing that you will notice when it comes to delivering venom is that the snake�s teeth are permanently erect. This is very different from the pit vipers in America whose teeth flatten against the roof of the mouth. Because of this, the coral snake does not inject its victim with venom, rather lets the toxin seep in through the open wound. The longer the snake can stay attached to the prey, the more venom can enter the body. Coral snake venom disrupts the nerve function of the body. Failure of the nerves to communicate will eventually cause respiratory and cardiac failure. These effects are not instantaneous, and many people who have been bitten will not experience side effects until twelve hours later. Thankfully, there have been no reported deaths from coral snake venom since the early �60�s when the antivenin was created. This, combined with the fact that the coral snake is reclusive, means that you are more likely to get hit by lightning than bit by the sea snake cousin. What could the colors of the coral snake blend in - Just because the coral snake is red, yellow, and black does not mean it sticks out like a sore thumb when hunting. The coral snake hunts primarily in the evening and early morning when the light is dim. It is not so much the color as the pattern on the snake, as many prey animals are relatively colorblind. The different banding widths break up the surface area of the snake, allowing it to easily blend in with leaves and groundcover. Instead of seeing colors, most prey animals will see a variance of shades. When coiled, the coral snake will be very hard to identify by its victim. Remember that humans are not prey animals for the coral snake. What we see does not matter at all in the scheme of the serpent�s life. If anything, we should be so lucky that North America�s deadliest snake is colorful enough to stand out when the rare encounter happens. There are many other snakes that have colorful patterns, some which feature colors that are rarely found in nature, like the blue coral snakes in other countries. It is not the color, but how the pattern and hue appears to animals that are used for food. © 2005 Wildlife-Removal.com - site content, photos, & maintenance by Wildlife Removal Animal Control, all rights reserved.